"This volume is an essential resource for the library of anyone interested in the field of career development, assessment, and counseling and should also prove invaluable for graduate students interested in immersing themselves in some of the best work being done today in the field of career development and counseling." "In this second edition, Drs. Brown and Lent continue to shape career development discourse and illustrate the ongoing significance of the fields of career development and counseling in the twenty-first century. This edition will help both researchers and practitioners alike to better understand, investigate, and promote the role of work in people's lives." 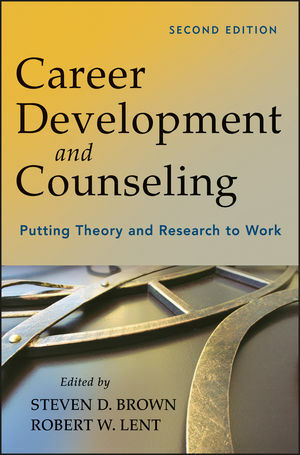 Edited by two of the leaders in the field of career development, and featuring contributions by many of the most well-regarded specialists in the field, Career Development and Counseling, Second Edition is the one book that every career counselor, vocational psychologist, and student of career development and counseling must have. STEVEN D. BROWN, PhD, is a Professor in the School of Education at Loyola University, Chicago. His research is focused on vocational psychology and applied psychological measurement. ROBERT W. LENT, PhD, is a Professor in the College of Education at the University of Maryland, College Park. His research is focused on career and academic development, counselor training and supervision, and psychological wellness.